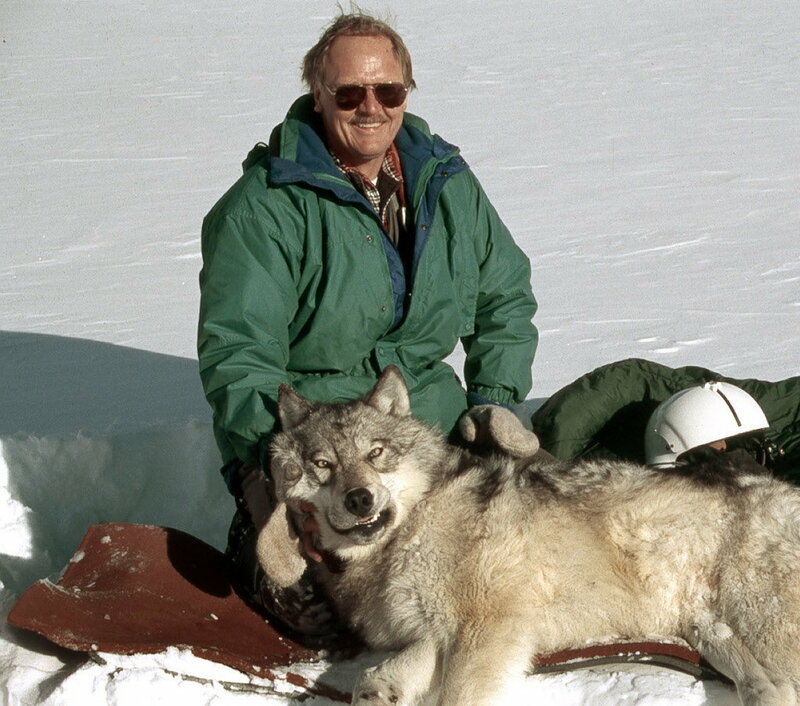 Carter was a government trapper, a wolf recovery coordinator for the US Fish and Wildlife Service, and many say the reason we have wolves in Yellowstone and Idaho’s Frank Church Wilderness. Clearly, someone I wanted to talk to but none of the people I met actually knew Carter, or if they did, not well enough to know how to contact him. I got nebulous and unhelpful pieces of advice like, he lives down in Boise now, as if Boise were the kind of small town you could drive into and swiftly find and charm a stranger into talking to you, as if it were a simple sweep of a butterfly net. Garrick gave me his cell phone number. A nervous phone call, a month with intermittent exchanges and one airplane flight later, I was standing in front of Carter’s house, meeting his poodle, admiring his flowers. “Jenny and I like to attract pollinators, provide food for the birds, bees, butterflies.” Their yard was a little piece of manicured nature in the city. The beds teemed with blooms even in September and the plants grew freely like they might on a mountain hillside, not in claustrophobic rows unnaturally geometric. Carter brought me out back and into his taxidermy workshop, which looked like the backroom of a museum or a university collection. The mounts were stunning. “I wanted to show you this, I guess it’s as close to a real wolf as we’re going to get today.” A bristly gray wolf stood in the middle of the room, its glass eyes staring intently off. I touched its rough coat and ran a finger along the curves of its ears. Around it and on the walls were pheasants, grouse, an owl, an enormous rooster, a pronghorn with one curled horn, a baby beaver, and Carter’s first ever mount from age 16: a mink bleached blonde by decades of proud display in his mother’s window. There was a line of raccoons and fox skins—road kill finds Carter told me he might one day make into a quilt to show people what’s out there dead on the road. As he walked me through various creatures it became evident that many of them he found dead and decided to preserve, give them a bit more life. I inquired about the process and he walked me through the steps of skinning, preparing the hide, creating the form to stretch the hide back on. It certainly was no easy walk in the park; the steps and knowledge of form were imperative of getting a good result. I could imagine the disastrous effects that might ensue from a less skilled craftsman. “I guess, this is my art,” he said thoughtfully picking up a precious little ermine that was staged curiously perched, its front legs on a branch. Taxidermy struck me as an artform in a way I don’t think stuffing dead things ever had before, and I liked the idea of Carter bent over wire and twine trying to decide how much stuffing needed to go into a partridge’s neck. We went to Eddy’s, a local breakfast joint where it seemed everyone in there knew him. Conversation flowed easily and I was amazed how similarly we—a government trapper, a man charged with killing ‘problem’ animals for decades, and a girl who became vegetarian when she was two and was told that meat came from killing animals—thought about the complex issues surrounding wildlife management. Carter’s beliefs were clear, based in ecology and decades of boots on the ground and eyes in the field*. It seemed like he had seen it all and met every type of person who feels passionately about wolves and/or grazing in the west. He didn’t let the politics bother him, but he wasn’t done being an active force in change either. Retirement seemed to be a way to pick what parts of the wolf management madness he wanted to partake in. “My old boss told me: Carter, get off the cross, people need the firewood.” He said laughing. But it was clear Carter wasn’t going to do so. We talked and laughed and vented mutual frustrations and disbeliefs until Carter’s voice gave out, (he had picked up a cold on his return from working with ranchers in California). If his voice hadn’t cracked and given up the ghost after five hours of storytelling, I think we might still be in that corner booth. I left invigorated by new information, with the contact information of everyone I could dream of in the West’s wolf world, invitations to planning meetings and rancher trainings—and an idea for another book. 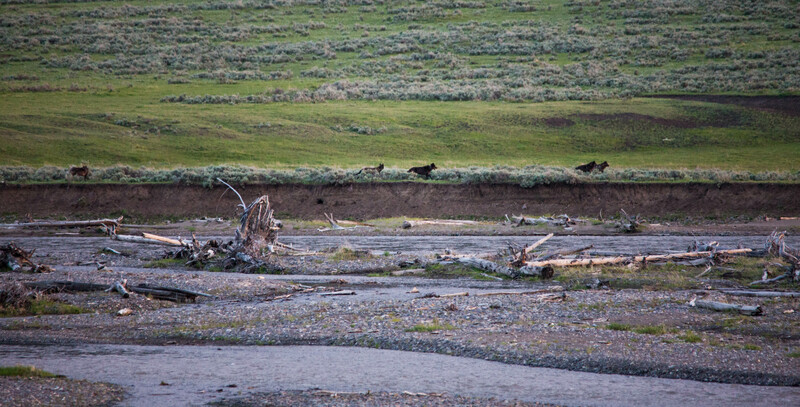 The Lamar pack trots along the Yellowstone river at dusk. *All the nitty gritty of our conversations will be published in my book—and I promise that Carter spins a good yarn and is filled with an amazing amount of interesting statistics and information about the west, Wildlife Services (if you can call it that), wolf policy, wolf behavior, and the fears, feelings and behaviors of ranchers. In the meantime, you can learn more about Carter by reading his Memoirs, Wolfer and Wolf Land. I so enjoyed reading your blog about your adventures in locating and meeting with Carter Niemeyer. He seems so full of intriguing stories. A man of the land. I look forward to reading your future book and being able to step into your experience.